Understanding Molecular Typography appears to be a textbook, authored by H.F. Henderson and published in 1992. In fact, Understanding Molecular Typography is an elaborate work of non-­narrative fiction created by Woody Leslie. The line between fiction and reality is blurry from the start. The book opens with a fictional title page that is also a true colophon. 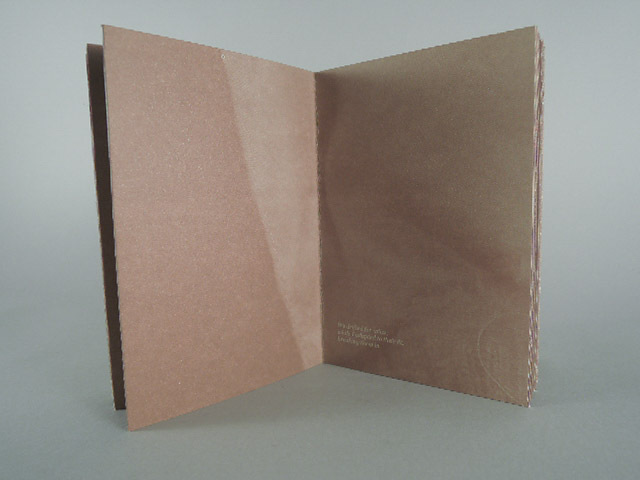 The book’s publisher is listed as Leslie’s own imprint, One Page Productions, and the title page accurately states that the book was printed at the Center for Book and Paper & Print Arts. However, the ISBN number and information regarding bulk purchases are fiction (sort of, the phone number listed is Leslie’s cell). Blurry, indeed. The book’s appearance helps sell the deception. 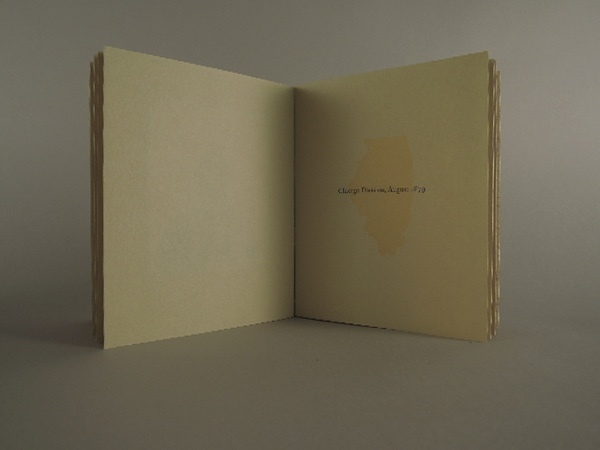 Offset printed, case­bound and covered in a standard dark blue book cloth with gold foil text, it appears to be a specialized text for a limited audience. 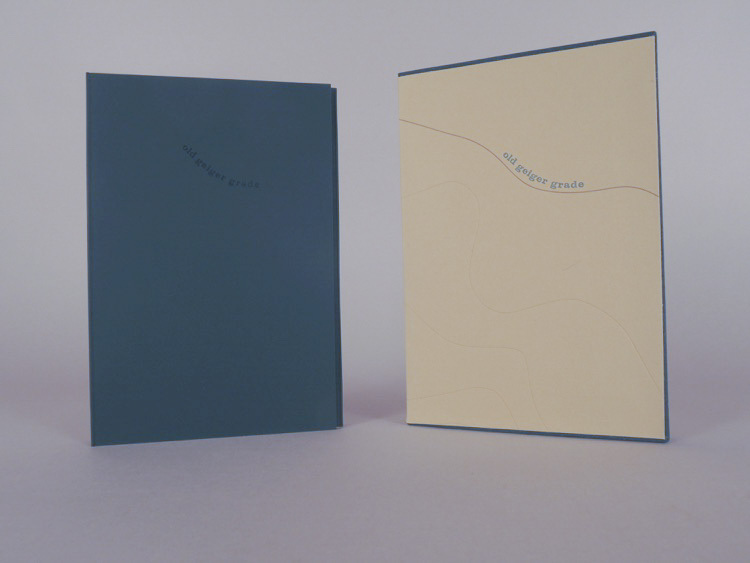 Even its smallest details like the blue and white headbands and goldenrod endsheets help the book look more like an academic or trade publication than an artists’ book. At a comfortable 4 x 6 inches, it is presented as a primer for the lay reader rather than an exhaustive academic textbook ­ a premise which allows Leslie to cover a lot of content and to do so in a humorous way. Before digging into the book as an artists’ book, it is helpful to summarize the content of the ostensible textbook. Understanding Molecular Typography is an introduction to the chemical structures of type, which determine the formation of letters and words. The book focuses on scholarship from the 1950s­1990s and attempts to synthesize more academic writings for the average reader. 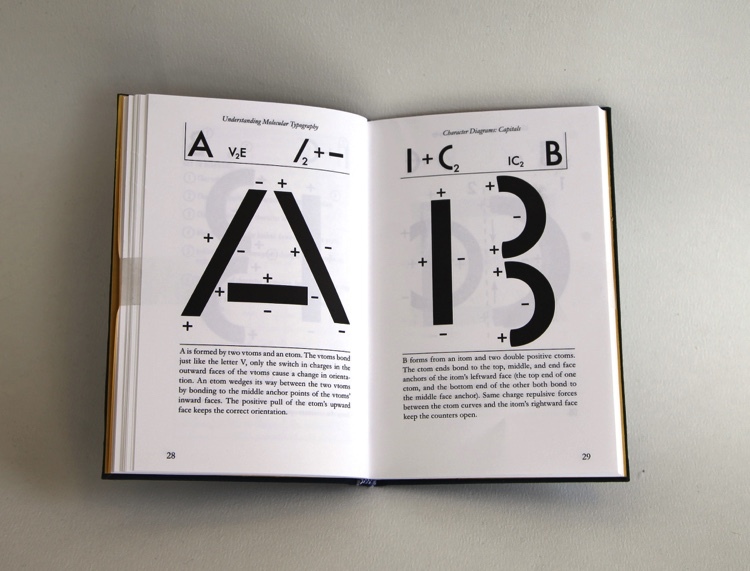 It explains how positive and negative charges bind basic units into letterforms, and anomalies like serifs and variance from typeface to typeface are discussed. 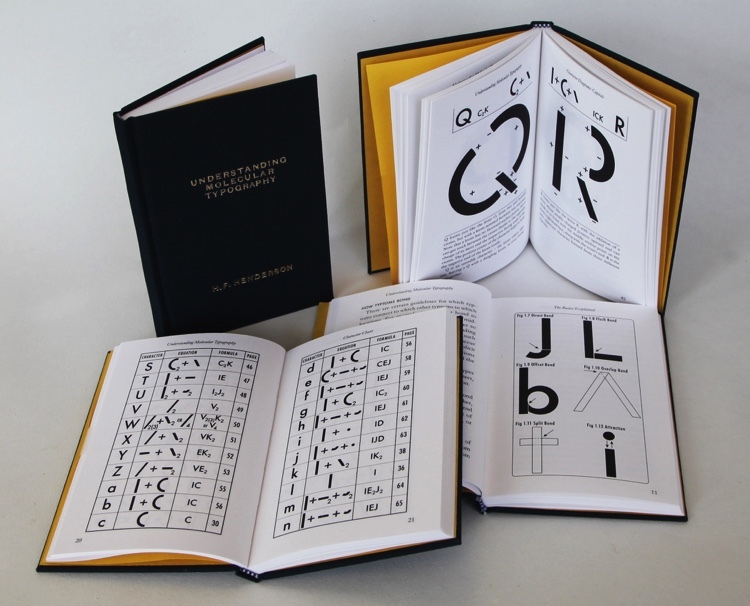 What follows is an extensive set of illustrations paired with written explanations of each letter’s chemical structure, using a notation system outlined earlier in the book. Henderson’s conclusion situates the field within a broader context, discussing the ecological, economic and many other implications of Molecular Typography. Just as the book’s structure is a conventional codex, the structure of the text itself is that of a standard non­fiction book. There are a table of contents, preface, and introductory remarks followed by various charts and diagrams, a conclusion, glossary, and bibliography for further reading. In form and content, Understanding Molecular Typography subverts the authority of scientistic writing through absurdity and humor, which are related and reinforce one another, but operate differently throughout the book. Absurdity abounds in both content and presentation, from the taxonomy of letter anatomy (‘typtoms’ like ‘itoms’ and ‘vtoms’) to the profusion of cross referenced figures and phonetic pronunciation guides. The specialized jargon and seriousness of presentation will be comically familiar to readers from their own studies in typography, chemistry, or some other discipline. In other places, a more direct humor erodes the book’s scientistic pretensions. In his author bio, H.F. Henderson is credited for his book, English is Easy, and So’s Your Mom. Rather than a dead give away though, this title also references the silly, often pun­-based names academics rely on to get their writing published. The bibliography also sports titles like “Stay Positive: The Ramifications of Charged Language.” Another source of humor are the intellectual acrobatics used to explain certain characteristics of type. The scientistic authoritativeness of Henderson’s explanations in combination with their utter incompatibility with the reality of type design is especially entertaining to the reader who is versed in the history of type or writing systems. Like a creation myth, these explanations have a naive charm and an admirable internal logic in and of themselves, but are made more enjoyable by their relation to type design, linguistics, chemistry, and other actual disciplines. The following passage epitomizes this humor and bridges the gap to a discussion of the philosophical inquiries behind the book. 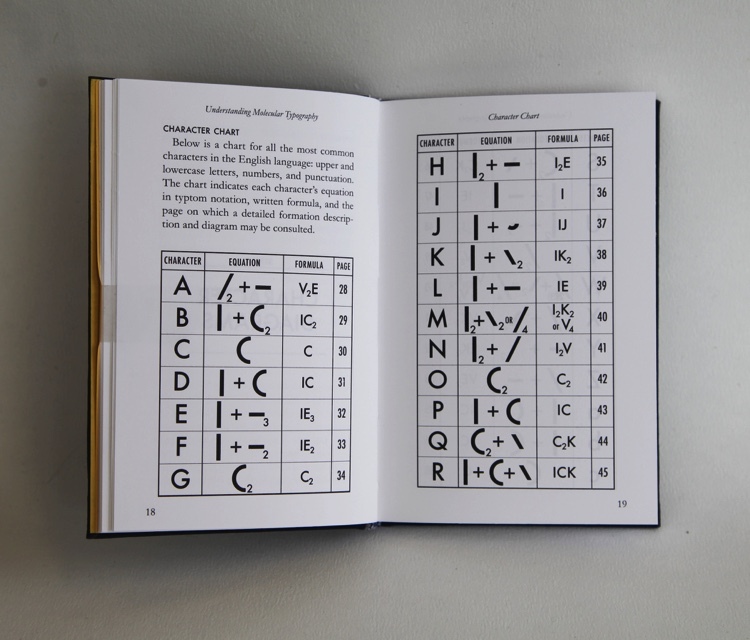 It would be enough if Understanding Molecular Typography simply co­opted scientific publishing and warned us not to uncritically accept authority, but by focusing on typography, the book also engages some of the most interesting problems of language. Like many artists’ books, the problems posed might be familiar to readers of Wittgenstein, Chomsky or Derrida. It should be clear from the descriptions above that the book is nevertheless not only accessible, but enjoyable. These implications are never didactic. Even when the fictional Henderson raises such quandaries directly, they are always one step removed from the real questions that Leslie poses for the reader. If a word’s meaning changes depending on the word that follows, does a word mean anything on its own? Are there ideas that cannot be expressed through words? If we understand the world only through language, are there limits to our understanding? Can we ever know precisely what someone means when they speak or write? Understanding Molecular Typography is not just for book artists, letterpress printers or designers, though those of us who are will no doubt find it especially enjoyable. It is humorous and thought­provoking on many levels, and takes itself only as seriously as it needs to. One can only hope Leslie eventually produces the many books and articles listed in the bibliography. From this footnote on page twenty-eight of Woody Leslie’s Parsely, one could guess the book is about words, storytelling, memory…and caterpillars. Specifically, it chronicles how the artist became transfixed by these creatures as they ravaged a plant he was supposed to be tending for his neighbors, who were out of town. This simple story is fraught with anxiety. The narrator struggles with his conflicting impulses and the plant interjects to voice its fear and indignation. Together they give their account like a bickering couple. All the while the caterpillars munch away onomatopoetically. 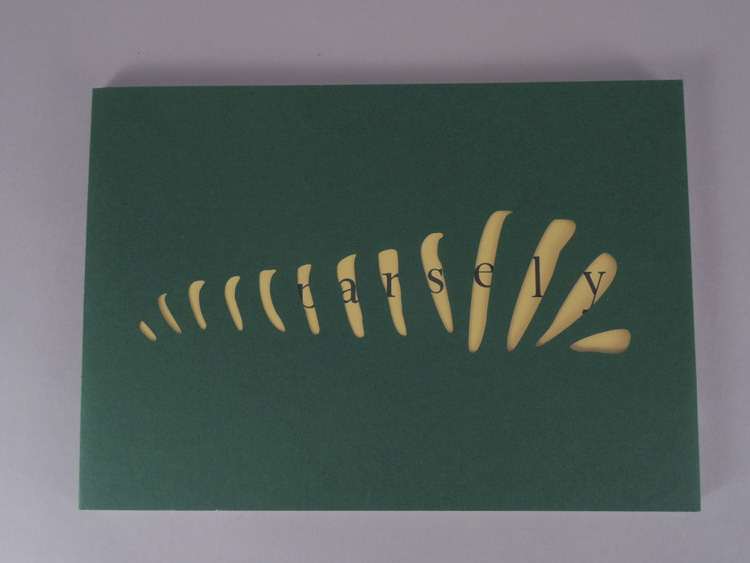 Parsely is driven by the written word, which accounts for its visual content as well as the narrative text(s). 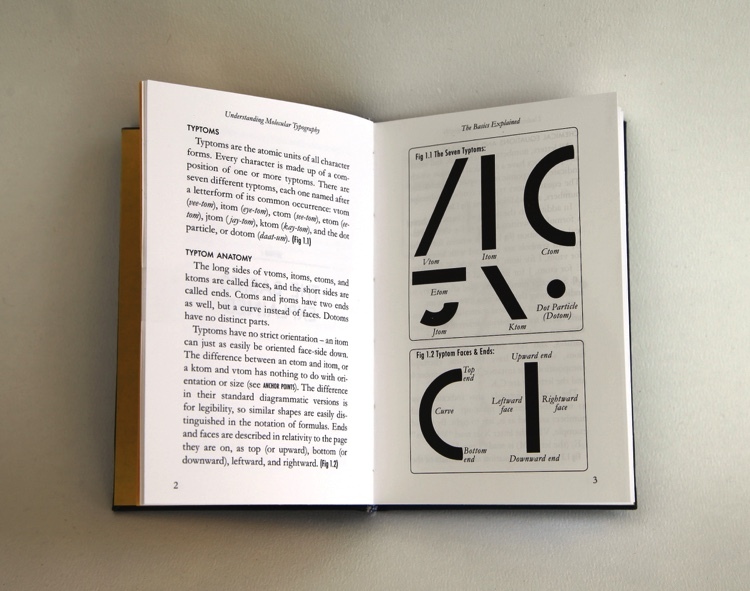 Its creative use of footnotes, page numbers and other features of book design epitomize the field of ergodic literature. Named for the Greek for ‘work’ and ‘path’, ergodic literature requires nonpassive effort from the reader. Extra effort may not sound like something one wants from a book, but Parsely draws the reader in with a humorous and relatable narrative. Leslie delivers this anecdote with such great intimacy and interiority, one could almost miss the book’s success as a veritable treatise on books and linguistics. 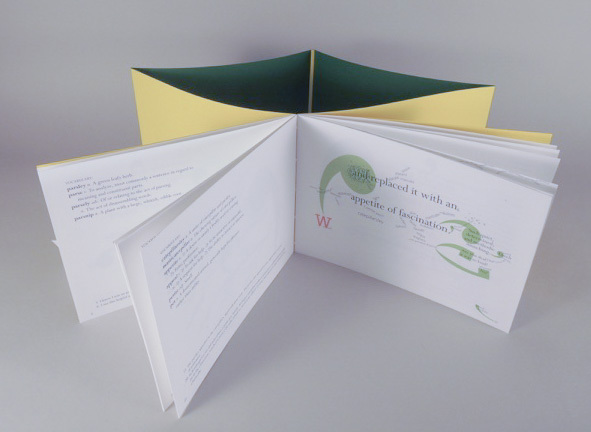 Parsely’s physical structure is a simple codex, a double-pamphlet binding in a paper cover, but its format enables the complex play of the text’s various elements. The main narrative, told in past tense from Leslie’s perspective, is set relatively large on the book’s rectos. Disrupting this space are interjections from the perspective of the parsley, which distort the temporal space of the book. The banter between Leslie and the parsley brings the book into the present. The sense of presentness is heightened by the chains of word associations that spontaneously grow from the main text as the storyline progresses. What begin as a few words branching off the story eventually form an intricate web of shared ideas and surprising connections. Across the gutter, the versos remain more rigid. A vocabulary section of real and invented words is positioned above a section of footnotes, which expands to accommodate new threads in the increasingly meandering narrative. As text expands wildly and takes over the space of the recto pages, these other elements of the book evolve more slowly. Leslie seems to outline a hierarchy, wherein certain aspects of book design or different kinds of content hold out longer against the linguistic entropy. Whereas the narrative, rooted in the subjectivity of memory and dialogue, begins to splinter immediately, elements like the repeated header ‘Vocabulary’ change slowly and subtly. 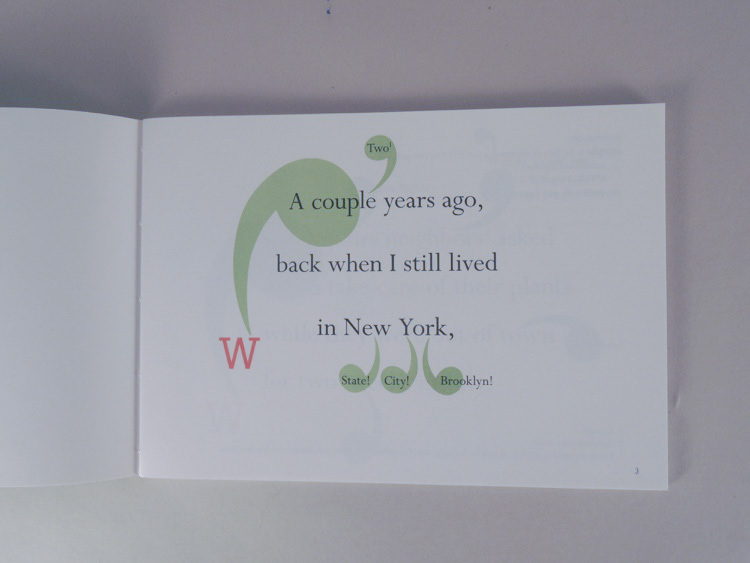 The format shines through in part because of the book’s restrained design. The color palette is limited. A pleasant bright green fills oversized quotation marks, which act almost like cartoon word bubbles to organize the dialogue on the page. A single red ‘W’ identifies the narrator, and the rest of the text is black. The typefaces are legible and understated. The primary narrative is set in Perpetua, which engages classic book typography and feels somehow leaf-like with its distinctive cut terminals. The many smaller words deviating from this text are set in Gill Sans, a suitable choice for such small sizes and a good pair with Perpetua, also designed by Eric Gill. Parsely appears less designed than it is. The vocabulary and footnote sections have the neutrality we attribute to authorities like the dictionary, as though such things aren’t designed or could not appear differently. On the other end of the spectrum, and the web of tangents and word associations appear wholly organic, spreading like a fungus or raindrops finding their way downhill. Between these extremes, Leslie’s use of quotation marks is a bold exception. The face and color of these marks do help indicate who is speaking and in what order, but they are also an expressive celebration of typographic form, rotating and overlapping to create odd yet familiar new shapes. Parsely demonstrates the powerful influence the book form can exert on the pacing of a narrative. It’s codex form and restrained cover design do not betray the variety within its pages. At the narrative’s climax, a page could take easily five or ten times longer to read than an earlier page. 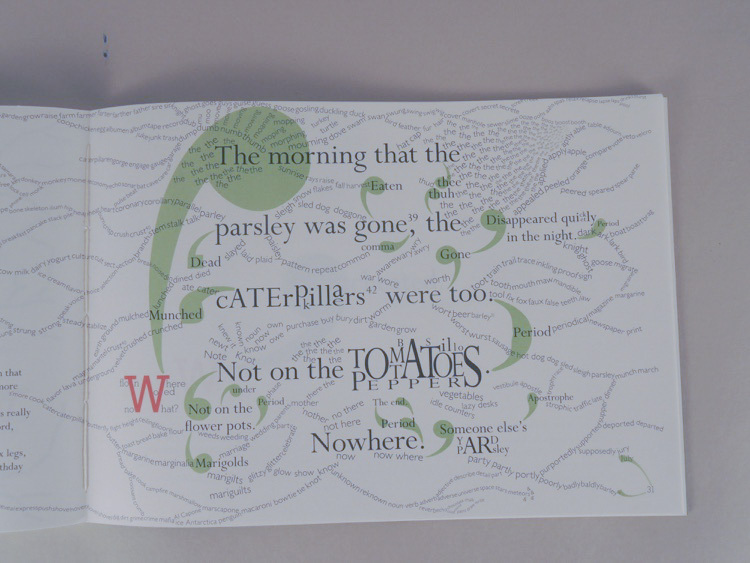 Combined with the text’s uneven entropy, the unusual pacing makes the reader keenly aware of time passing, which heightens the drama of the caterpillars and parsley. The unpredictable leaps from one page to the next create an uneasy sense for readers who are used to the experience of finishing a novel, thumbing through the final pages and wondering whether there is still time for a happy resolution. Parsely plays with this tension between the clearly finite codex form and the difficulty of predicting exactly how and when the plot will resolve. The uncertainty of the resolution is strongest when the book guides the reader backwards by recycling a footnote in a new context. These footnotes are the exception, but they show that the book could continue even once the plot is finished, rendering useless that familiar feedback of pages counting down in one’s right hand. The footnotes are arguably the most poetic aspect of the book, rarely linking an idea with the most obvious word, but instead taking the reader on a circuitous path through the narrator’s memories and associations. This movement among ideas, from one word to another, is the heart of the book. Sometimes the link is clear—a pun, a near rhyme, a common phrase—but elsewhere the reader follows a train of thought entirely contingent upon the artist’s own history. These idiosyncrasies, which make sense given the personal style of narration, expand exponentially when they stray further from the original plot. For instance, when the footnotes spawn more footnotes, decoupled from the main narrative, but integral to the work’s meaning. 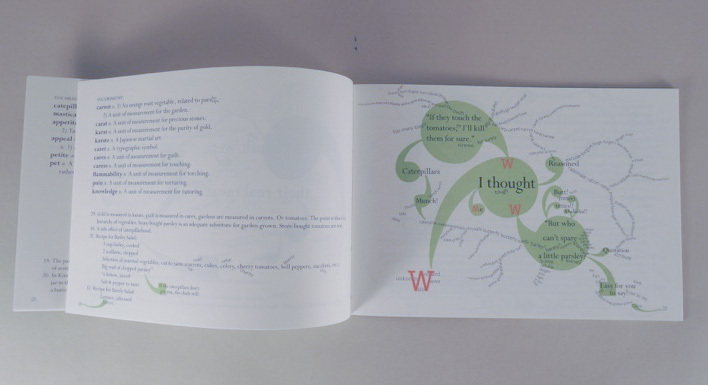 Parsley reveals that the book is a generative form, not merely a container for text. Even the page numbers interject to support or otherwise engage the text, and give the reader insight into the narrator’s world. This glimpse into Leslie’s mind feels authentic. As narrator, he alludes to an early interest in etymology, and it is easy to believe given the book’s particular brand of etymological humor. There is also an obsessive quality that seems hard to fake. Beyond the sheer quantity of words (and there are a lot), the connections between them would only be made by someone who views language as terrain for play. The reader may get in on the joke, but with the sense that it was a joke for the artist, and would happily have been made were there no other readers. Yet, the artist did decide to share the book, and the muchness is balanced with careful editing. There are many words, but none are superfluous. This meticulous attention paid to harnessing the book’s text paradoxically lends further authenticity to its celebration of language. Parsely is philology in the literal meaning: a love of words. There is no single theory of linguistics being promoted, and there is nothing didactic about the book. The narrative is not just an excuse to make a book about language. If anything, the book seems envious of orality, marveling that dialogue seems so direct and effective, but is so slippery and tenuous. The linguistic investigations are practiced rather than theorized. They focus on the way language is actually used rather than the precise meanings of words. Leslie doesn’t discuss whether neologism is really the feature that separates human language from animal communication, he simply coins new words that the reader will no doubt understand. Likewise, he demonstrates how the small shift from bat to cat to rat, etc. conveys a whole new concept in the reader’s mind without a discussion of “rigid designators” or other philosophical baggage. A psychoanalytic angle emerges organically among the word associations and parallel trains of thought when, for example, a particular digression reveals the narrator’s inner conflict over the caterpillars. These explorations will be of interest to many readers, but the book’s focus on dialogue and everyday language is what stands out. Like good observational comedy, Parsely points out little inconsistencies that speak volumes about social interactions. Euphemisms are a great way to shirk responsibility. Space is understood, seemingly, in spite of prepositions rather than because of them. Communication in general seems so sloppy that social norms dictate one must not hold another to too great a standard of accuracy. A couple is rarely just two, a week is not always seven days, and most people would not insist on either of these points. In Parsely, language is revealed in all its strangeness, and it is left to the reader to wonder why it is the way it is. 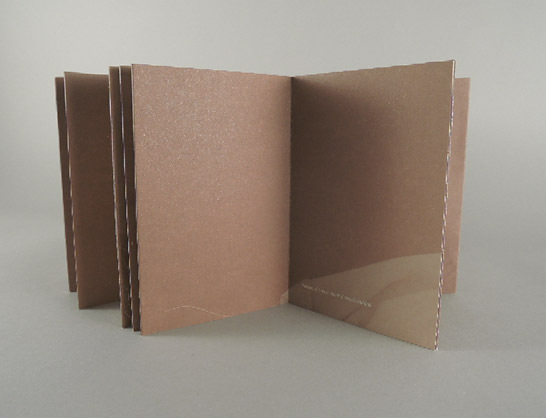 One message is clear, though: the artists’ book is a potent and enjoyable form for reading and writing narratives. 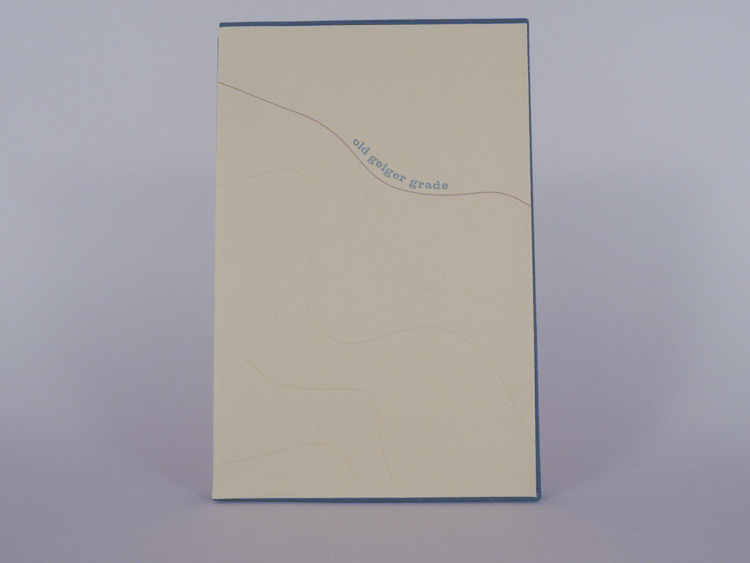 It’s hard to say whether Old Geiger Grade, created by Jaime Lynn Shafer at Black Rock Press, is primarily sculptural or narrative. 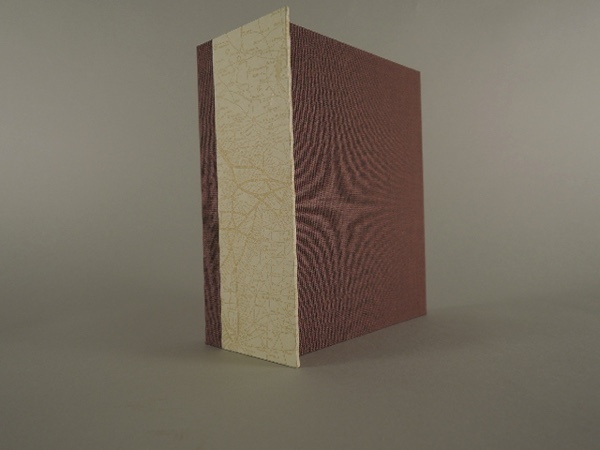 The letterpress-printed book is a straightforward codex, but its drum-leaf binding cleverly accommodates pages which have been excavated and built up to form a dimensional topographic map. It is among these geological features that the printed narrative resides, tracing a journey along the titular road – a stagecoach route to the famed Comstock Lode in Virginia City, (present day) Nevada. The project was created for the Black Rock Press Redfield Fellowship, which aims to link the press with other institutions at the University of Nevada, in this case the W.M. Keck Earth Science & Mineral Engineering Museum. As the colophon explains, parts of the Old Geiger Grade have morphed into modern roads and can still be traveled, part of the enduring legacy of mining in Nevada. This historical emphasis is only a springboard; Old Geiger Grade is more contemplative than educational. To set the scene, Shafer leads the reader into the 1860s Wild West through the book’s outer elements. 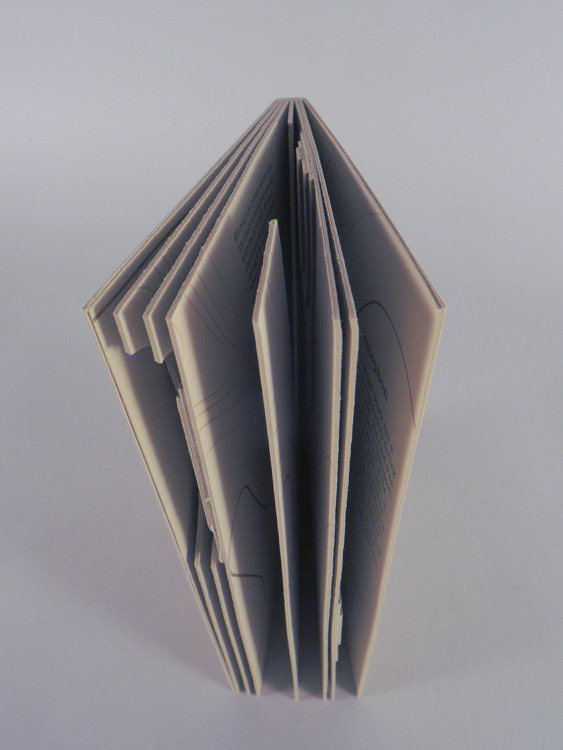 Upon extracting the book from its slipcase, the reader finds it folded into a paper wrap. Printed on the wrap’s inside front is a list of “Stagecoach Rules”. Presented without comment, the rules could be taken directly from some historical document, but they have a quaint charm that feels almost too good to be true. 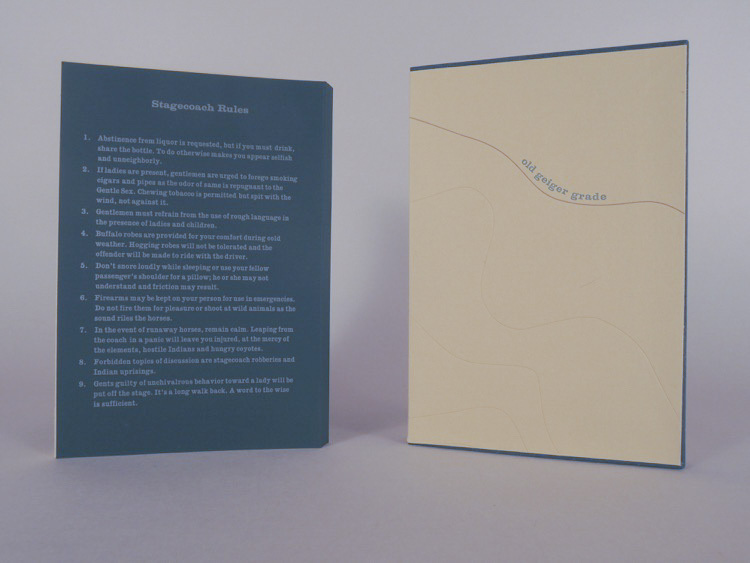 Regardless, the rules form an imposing block of text on the front flap, physically barring the reader from entry into the book. From the ominous prohibition against discussing “stagecoach robberies and Indian uprisings” to lighter guidelines about gentlemanly behavior, the rules raise the stakes for the narrative inside. The reader is introduced to the Nineteenth Century with all of its implications for race and gender, not to mention a looming specter of danger. The descriptive narrative within the book is subtle, especially in contrast to the list of rules. Two categories of text share the page: an account of nine stagecoach passengers, and some names of places along their route. The narrator and other passengers are left mostly to the reader’s imagination, a task which is aided by the characters (gentlemen, ladies, outlaws, and so forth) outlined in the preceding rules. The stagecoach is a liminal space, better suited to reflection than a conventional story arc. The reader never learns whether the travelers arrive to Virginia City and strike it rich, but instead shares in the hardships of the road and measures time as much through the rhythms and pains of the body as through their progress across the map (which fittingly provides no compass or legend). 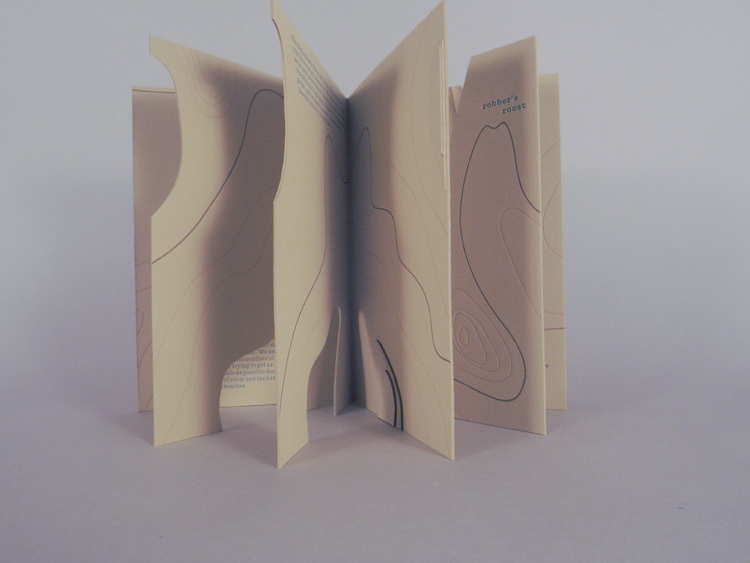 The story’s understated style helps highlight the book’s most striking feature – the topographic layers, some hand-cut from the pages, and others built up with laser-cut shapes of paper. The choice of Rives BFK paper not only has an evocative desert color, but also an almost sandy texture and enough dimension to maximize the effect of the topography. The doubled sheets of the drum-leaf binding feel almost like a board book, but more sophisticated thanks to the printmaking paper (and, of course, the concept and content). Not all of the topographic elevations are rendered sculpturally; some are printed in a gold with enough impression to qualify as dimensional in their own right. 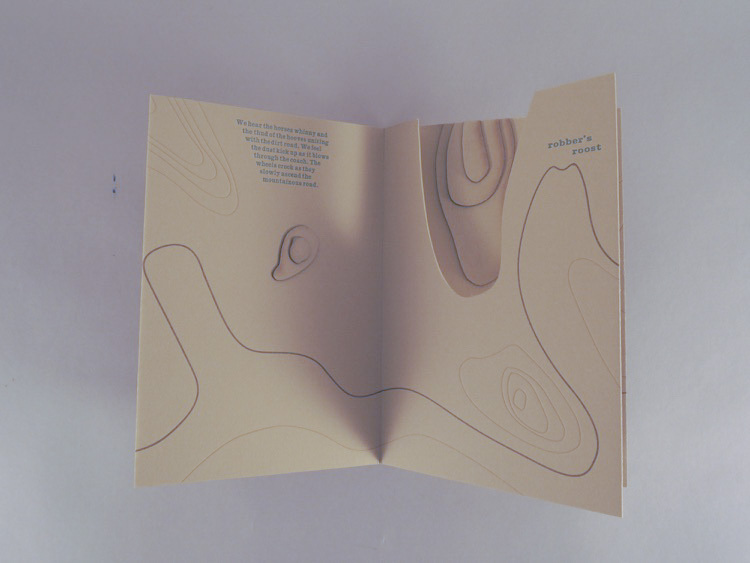 These printed lines form a cohesive visual vocabulary with the edges and shadows of the cut paper pieces, and also integrate these landscape elements with the road itself, which is printed in a darker golden brown. This small color change is all that distinguishes the route from the land it traverses. 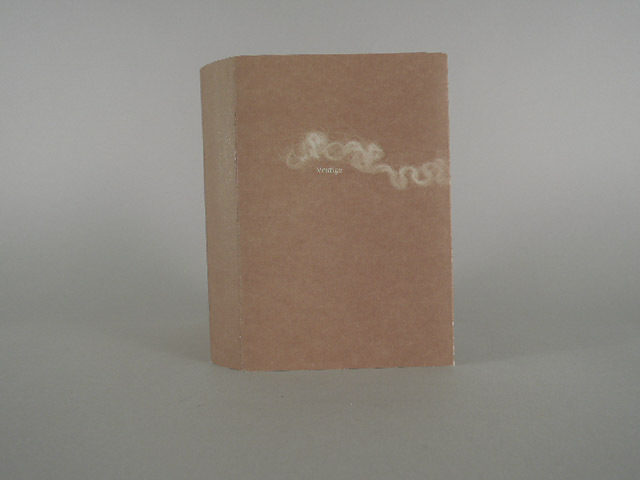 The marks that are built in relief, rather than printed, are planned carefully to activate the book temporally and spatially. The cut away elements allow the reader to glimpse the future and past, in turn. On the recto, the negative space reveals some future part of the trail. This preview is narrowly framed, adding to the sense of suspense. “Our shotgun stands guard… without him, our lives would be in grave danger”. Will the turn of the page reveal danger or some other surprise? Once a page is turned, the same space, now on the verso, sustains an earlier thread of the story, recontextualized. For instance, a description of the cramped conditions and hard wooden benches persists through three turns of the page, stretching out the narrator’s discomfort for the reader to experience. Like this temporal play, the negative and positive relief enacts in space the textual descriptions of the desert landscape. Read in scale to the printed map, a few millimeters on the page represent the “treacherous and frightening” terrain in a direct, tactile way. The extra attention these pages require from the reader seems to be its own form of navigation along a demanding road, though admittedly lower risk. All of this succeeds because of the remarkable planning and craftsmanship that went into production. Where two layers of page are built up to form a cliff, a perfectly placed two-page hole is aligned to fit together just so, but with organic shapes and fluid placement, these relationships never feel forced. Though the reader knows that each additive form must be met with an equal subtractive counterpart for the book to close, the novelty of this sculptural mark-making never wears out. 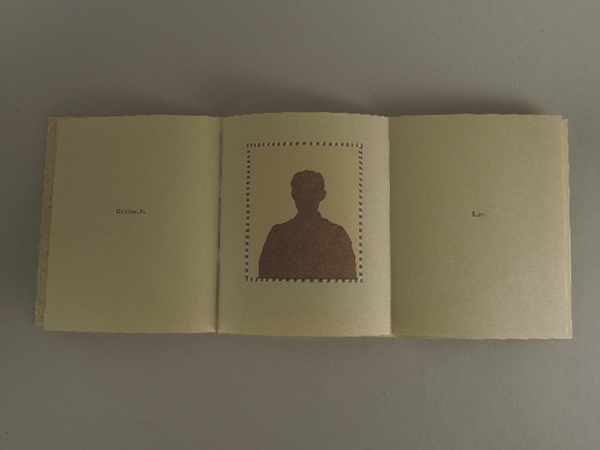 The minimalism of the blank paper, with its subtle cast shadows and delicate scorching from the laser cutter is beautiful in a way that complements, but also transcends, the book’s narrative and setting. This beauty, freed from the utility of a proper map or atlas, is akin to highway driving through the Southwest; history is visible, tangible, in the layers of sedimentary rock, but open more to imagination than interpretation. Silver mining is a similar act of time travel. As people traverse mountains, or dig for silver, their struggles play out against the immense backdrop of geological time. The uncertain fate of the characters, now deceased for generations, against this indifferent landscape which remains today gives Old Geiger Grade a sublime edge that resonates beneath its beauty. 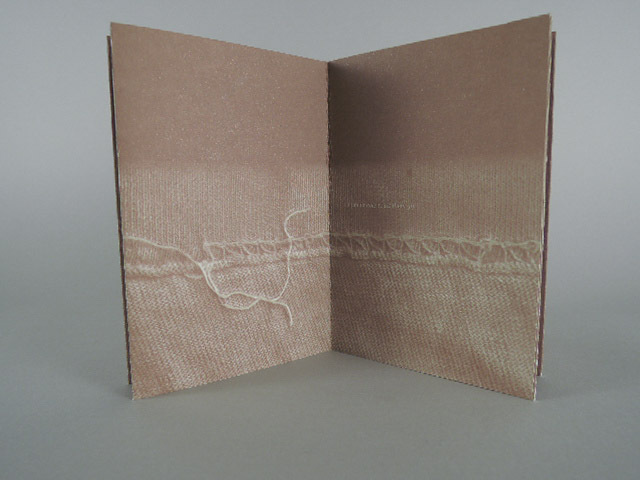 Vestige by Sue Carrie Drummond is an offset printed bound concertina that examines the artist’s relationship to clothing she has kept for sentimental reasons. 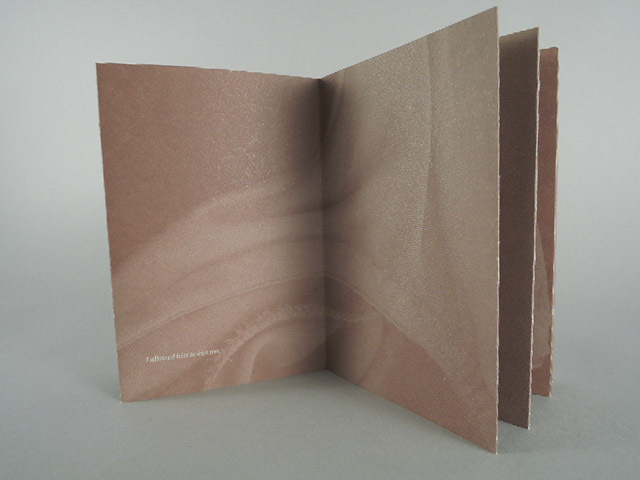 The book is printed monochrome in a rich, warm brown. The darkest browns are in the sizable negative spaces, while text and imagery are knocked out to varying degrees of lightness. 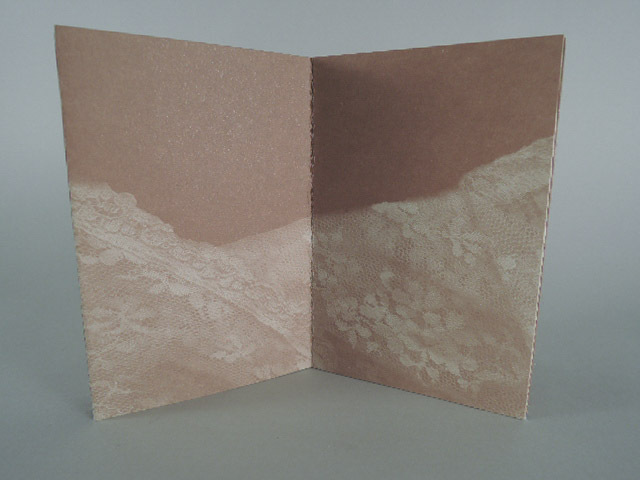 On warm off-white paper, even the brightest elements feel soft and delicate. The limited palette and minimalistic images make Vestige cohesive and immersive. Vestige is driven by its text; lyrical prose written in first person. Via worn out articles of clothing, the narrative covers the writer’s relationship with her father, mother, friends and lovers. The book culminates with one romantic relationship, but the earlier ones help introduce the narrator and provide the context for that relationship. The narrator’s relationship with her parents seems to foreshadow and impact her romantic life, but is interesting and relatable in its own right. More than any specific relationship, Vestige is about the narrator’s way of relating to her own past and the people who shaped it. Text and image are sparse. Meaning is found in subtlety: pacing, composition and juxtaposition of text and image. Passages employ metonymy and double entendre to slow down the reader, complicate the narrative, and reconcile the book’s lyrical delicacy with its charged confessional content. Pertaining to hand-me-down clothes as well as ex-lovers, the double reading is reinforced by the background imagery, which has transitioned from the fabrics of old clothing to what appear to be bed sheets. As the metonymy becomes more obvious in these middle pages, the reader is encouraged to reread the more ambiguous beginning of the book, which now takes on new depth. Structural and compositional clues help readers navigate these ambiguities without resolving them, which would rob the book of its richness. Pages without text serve as transitions between trains of thought. The result is a book with three loosely demarcated sections and a conclusion, all of which blend fluidly together. As one reads, the book is unified and the narrative progresses naturally in chronological order. On a second reading, one begins to note correlations between text and image, pacing and composition, which signal shifts in tone and subject. For example, in the opening section of the book the images of a sweater hem stretch the full width of each spread and the text sits just above this horizon line. These compositions feel stable, calm and strong; the narrator talks about her parents. As the book continues into the tension and confusion of romantic relationships, the text sinks to the bottom of the page and the images are angular and unstable. Even the relative sharpness or softness of the imagery fluctuates throughout the book and influences how the text reads. The book’s strength is in the way that gradual shifts in mood and increasingly loaded figurative language effectively expand the narrative. This gradual departure from the literal requires a reappraisal of what has already been read, and poses multiple readings of the content to come. In this way familiar symbols, like clothing and domestic spaces, elicit explorations of deep psychological territory like memory, relationships, and the body. The depth of these topics transcend the narrator’s specificity, which allows readers to contemplate their own relationship with the past, and the objects and places that define it. Vestige encourages introspection, but also empathy. Circular Logic draws from company circulars from the Chicago, Burlington and Quincy Railroad (CB&Q) archive at the Newberry Library in Chicago. Specifically, the book presents an account of terminated employees and the reasons they were fired. Olson makes a number of choices that reinforce the book’s relationship with the archive that inspired it, which ultimately positions the book as commentary on the concept of the archive as well as the particular content. 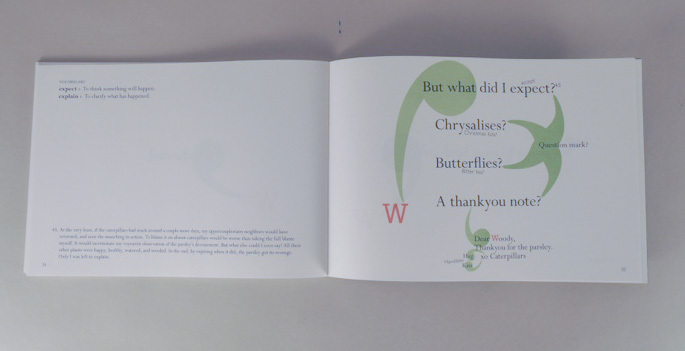 Even the book’s housing in a trifold portfolio straddles the vocabulary of books arts and conversation. The paper has the look and feel of aged newsprint, and the typography and imagery have their roots in the 19th century. 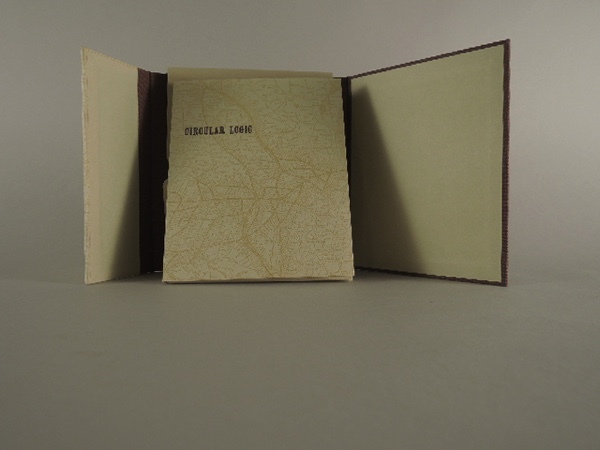 Additionally, a number of indexical elements point to the railroad, including a rail map that also serves to unify the book and its cloth covered portfolio enclosure. Circular Logic is a pocket sized codex. The cover is letterpress printed with a CB&Q Railroad map on heavy cover stock and the text block is attached only to the back cover. 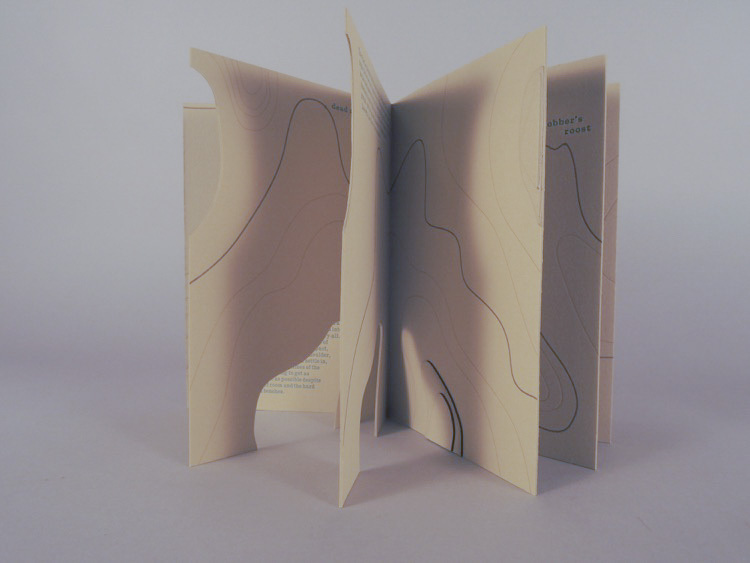 This allows the viewer to open the book completely flat and also to appreciate that the link stitch sewing was done across tapes printed with the same map as the cover. 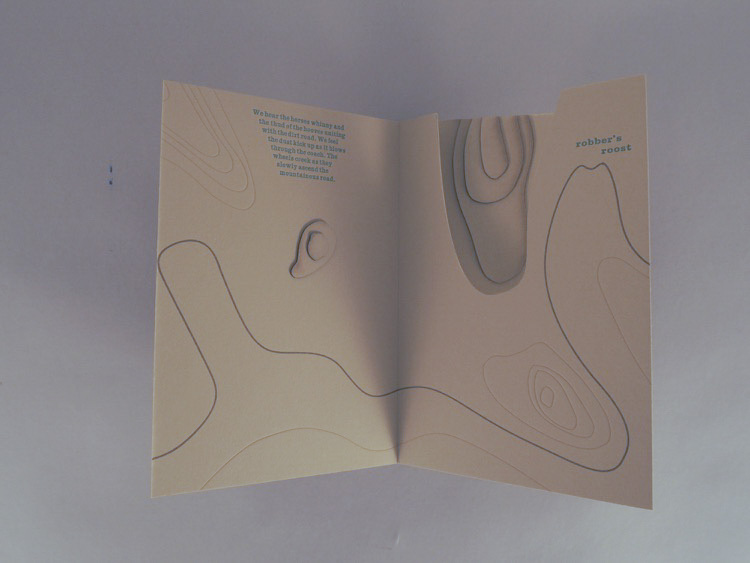 The next surprise is that each recto folds out to create a three page spread. The initial spread shows an employee’s name on the verso and their job title on the recto. The second action, unfolding the right hand page, reveals a portrait of the employee in what is now the center of a three page spread with the reason they were fired on the far right. Through this structure, the reader is anachronistically implicated in the employee’s termination. Hidden behind the folded page, the employee is in limbo like Schrodinger’s cat, both alive and dead, simultaneously employed and terminated. Only when the reader turns the page to view the portrait is the employee fired. 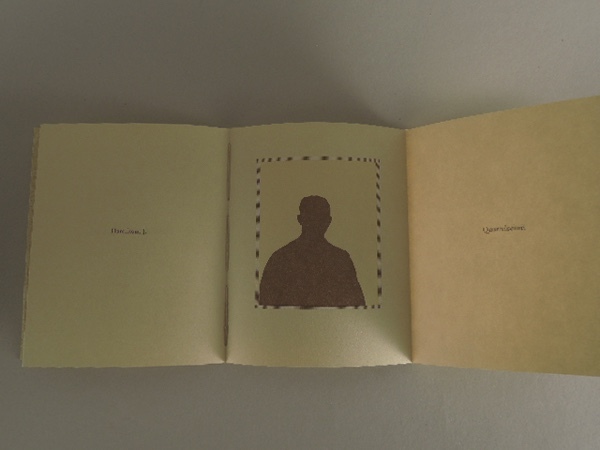 The temporal confusion recalls Barthe’s observation that in film (but also artists’ books which are sequential), images operate in the future perfect tense; they simultaneously have-been and are-yet-to-be. However, unlike in film, the reader of Circular Logic determines when the yet-to-be is enacted. Perhaps knowing that the subject is already deceased lessens the burden of firing them. The result is a sort of game theory, driven by the reader’s curiosity and a sense of schadenfreude, which is strengthened by the comically quaint rationale for many of the terminations. The book’s three-page spreads, each with a portrait in the center, resemble an altar or the kind of hinged triptych photo frames reserved for the nicest family photos. Either reference lends the book a quality of intimacy and remembrance. Formally, the three page spread also creates enough white space to balance the weight of the subject’s silhouette. The left and right pages have no more than a couple words, printed in small type, against stark expanses of white space. What these spreads lack in narrative, they make up for in spacial composition. The minimal text, quoted directly from the company circulars, thus seems all the more matter of fact and impersonal. The type is set in Bulmer, which makes sense historically; perhaps it is the exact face used in the original circulars. The typography, in terms of size and typeface, certainly adds to the bureaucratic sensibility. As a narrative text, Circular Logic is unusual, introducing each character at the same plot point: their immanent termination. The characters exist parallel to one another, tragic figures connected only through their misfortune, destined not to interact. Even their names have been altered, which heightens the bureaucratic aesthetic. The reader is challenged to sympathize with subjects whose identities are obfuscated at every turn. The flat silhouettes divulge mostly hair style and head shape and do little to lessen this challenge. The portraits are printed from photopolymer plates exposed using hand cut rubylith stencils. The images are derived from anonymous photographs from the same era, and the image making process also seems to recall the paper silhouette portraits that proliferated around the turn of the nineteenth century. Combined with the altered names, the anonymity of the silhouettes reinforces the idea that the subjects’ identities are being withheld to protect them, whether out of compassion or bureaucratic best practices. Behind either rationale is a tinge of comic absurdity given the book’s obscure subjects, small edition size, and artistic intent. 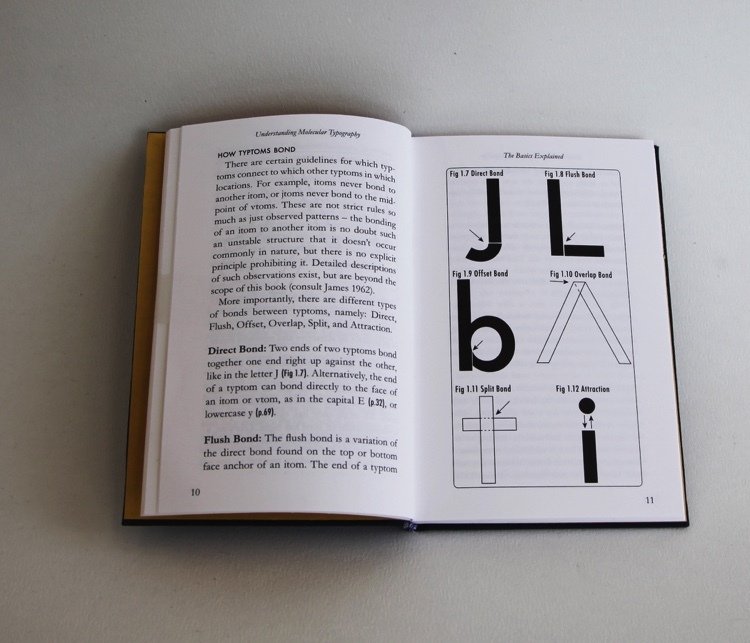 Given the historically appropriate typography and imagery, it is from the design decisions and details surrounding the imagery that the book’s artistic license emerges. 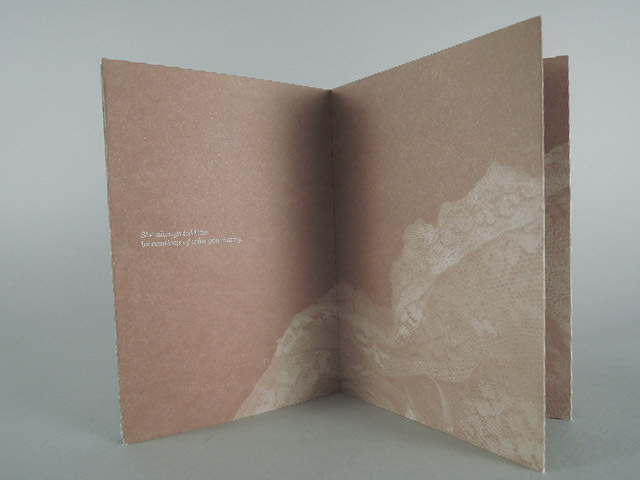 The silhouettes are printed in brown, matching the title and inside text as well as the cloth cover on the book’s enclosure. 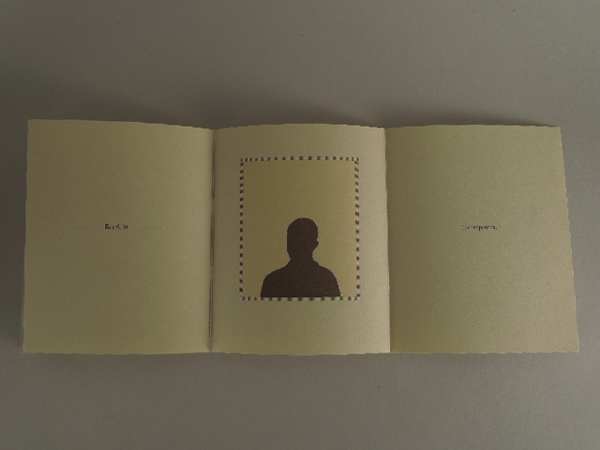 Each silhouette is situated in a rectangular frame, the same on each spread, which is printed in the same golden yellow as the route map on the cover and spine. The yellow frames are surrounded by a brown ornamental border; a simple pattern of hatch marks. This pattern is a ubiquitous letterpress border, but in this context it reads perfectly as a railroad track. 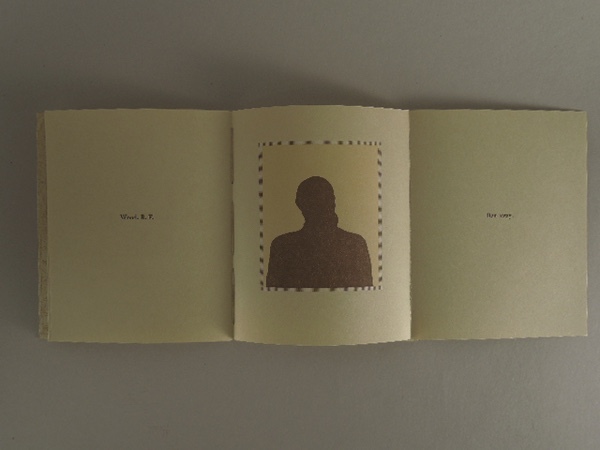 The presentation of each portrait unifies each spread with one another and with the book as a whole. This unifying function is one way Circular Logic interrogates the concept of the archive as well as the specific content of the CQ&B Railroad. The reader receives an orderly presentation of certain data, which looks and feels like an archive but may have little in common with its actual source. As Olson explained at a recent panel discussion in Chicago, Circular Logic grew out of her own time working with the CQ&B archive at the Newberry Library. The book is not a simple representation of the original archive, but is the product of reading, editing, and reproduction, which are all creative acts. Decisions like withholding the subject’s real names and obscuring their identities, the book both uphold certain scholarly conventions (even to an absurd degree), and simultaneously question the archive as a source of truth and objectivity. Olson activates the archive and then invites her readers to do the same.